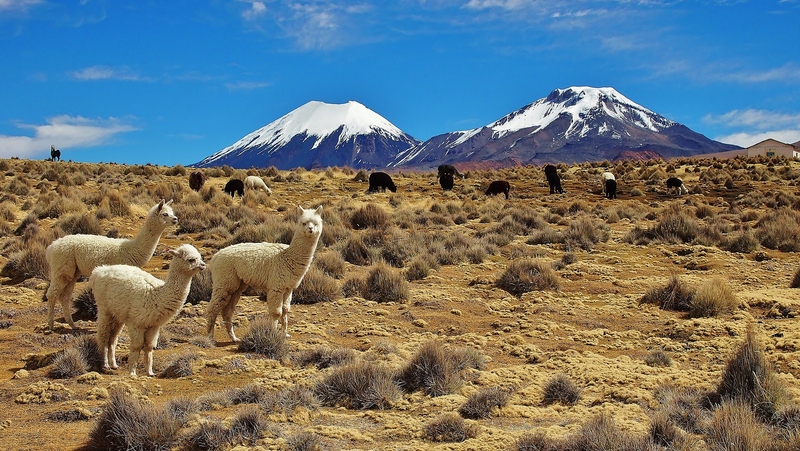 Sajama National Park in Bolivia is quite simply amazing. It doesn´t feature much in the guide books, it’s pretty hard to reach and generally just too much hassle for most. However this means vast unspoilt landscapes remain surrounded by spectacular mountains, empty hot springs and a real sense of adventure. It really is one of the greatest places I have ever been. 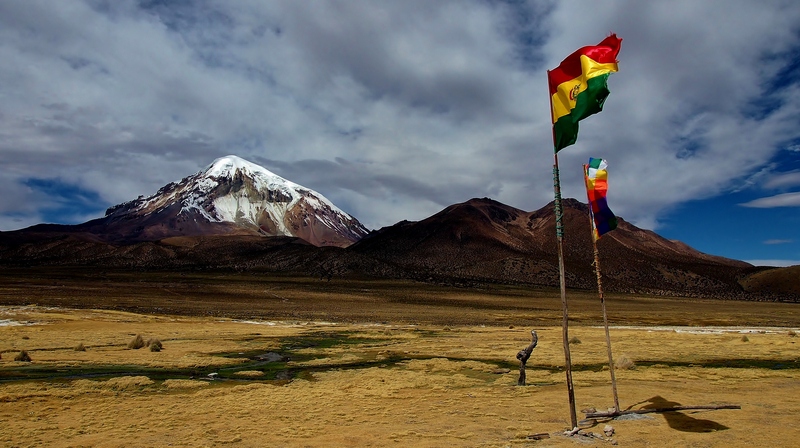 Our approach started in Oruro located in the cental altiplano of Bolvia. It was an unexciting and slightly random town, we were there to explore the city but quickly decided to book a bus back out again. The bus we booked was bound for Arica in Chile, but we were planning to hop off in the middle of nowhere and walk or hitchhike into the Sajama national park. In reality we couldn´t quite follow the Spanish instructions at the bus office but it seemed the bus we had booked, didn´t go exactly where we wanted. We had to get a local bus 125km to meet another bus from La Paz at a random road junction and I suspect we paid more for this privilege than the locals! After waiting for an hour in the middle of nowhere we caught the connecting La Paz bus heading to Arica. 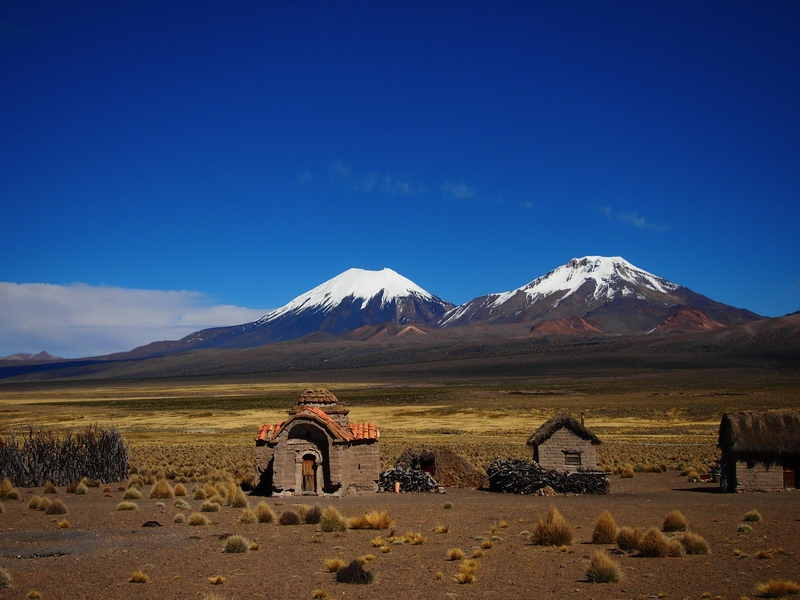 A kind Chilean man, who is now my facebook friend, translated our plans for getting to Sajama for the driver to understand, so everything was working out just fine. Then we missed the turn off to the park, apparently we could get a taxi easier from Tambo Quebo the border town, I suspect the driver just forgot! After 2 hours waiting for a taxi in Tambo Quebo it seemed walking might have been a better option. Thankfully we were allowed to sit in a telephone booth shop, if that’s the proper name for these places, to keep warm. The border is at 4000m+ so the air is pretty cold as sunset approaches. The warm ‘shop’ was in reality the dodgey border crossing fixer. It was interesting watching, as every 5 minutes another man came in and handed over cash, received cash or received small parcels over the counter. This was clearly the place you could get whatever you wanted in the area. (except a taxi!) Apparently the taxi drivers were all at the Fiesta or something, but finally a local man was tracked down and in the now complete darkness we handed over 100 Boliviano´s to finally get into the park. As I said accessibility for the independent traveler is not straight forward. 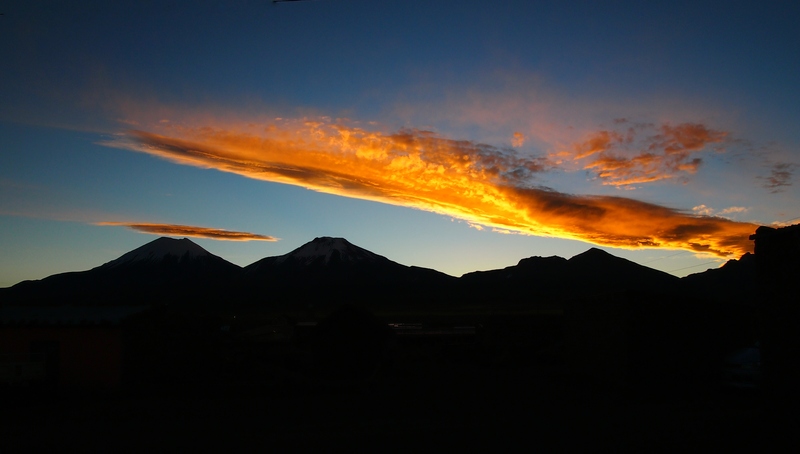 The shot below is a stunning sunset over the village of Sajama. After a scary and bumpy ride down a long dirt road we pulled up in a village, it was almost completely dark except for the odd electric light flickering. We entered the only open hostel in the village. A 5 year old boy showed us to our room. We had our own 6 bed dorm in a domed, hobbit like building covered with grass and made with mud brick walls. The en suite had no hot water but was pleasant enough as it avoided a cold late night trip outside! At 4600m the village was rather chilly under the clear and starry sky, not even the bright glare of the perfectly defined Milky Way helped. We brought food with us so chose to decline the hostel dinner on offer. This seemed a lucky escape when we entered the kitchen. I am pretty used to eating at random places and from roadside stalls but this was different, dirty plates everywhere a rack of dead animal parts, bones and a hacksaw for preparing, kids running around and few dirty pans used for cooking. Maybe the altitude prevented bacteria but I was happy as Marion prepared our boring pasta, the other few guests enjoyed their dinner in ignorance of what lurked behind the kitchen door! Next day we hiked for about 6km which at that altitude was quite breathless. We arrived at some remote empty hotsprings, with the best view you could possibly imagine, take a look at the photos! We walked back between Llamas and volcanoes, visited deserted mud brick villages, saw the odd nomadic looking man aimlessly wandering around. There was another hike we were recommended which was to some geysers and up some hills with great views. 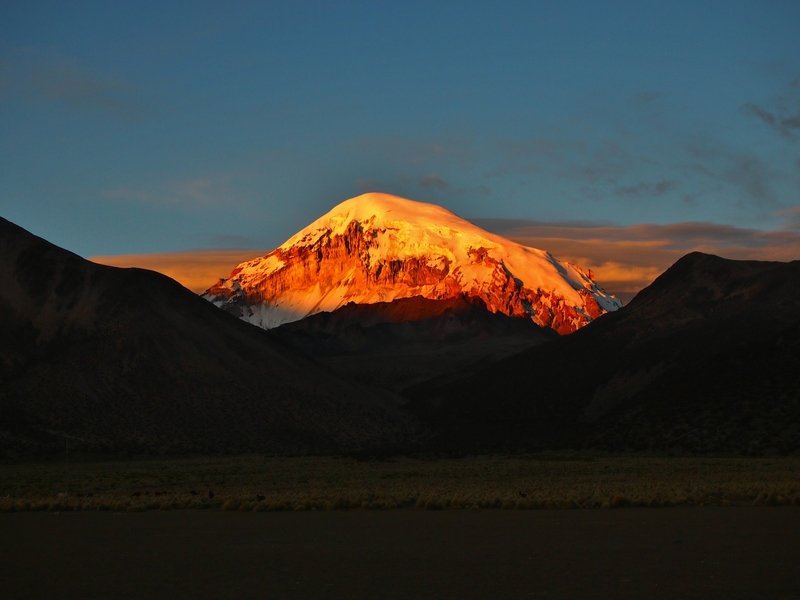 Another option is a hike/climb up Sajama the highest mountain in Bolivia at about 6542m, which we passed on. Apparently the locals had a football game at the top a few years back, so can’t be that bad to climb! After a few days staying in and exploring the park we shared a lift back to the border. 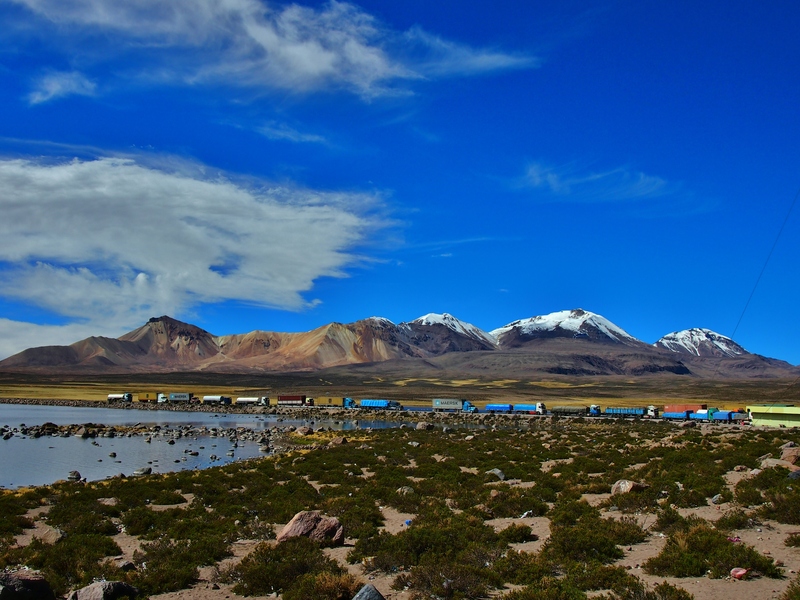 We then hitched across no mans land to Chile with a kind border official, his car had seen better days so we gave him a few Bolivianos for the ride, retrospectively thinking it is probably not the done thing to give Chilean border officials cash, but never mind. 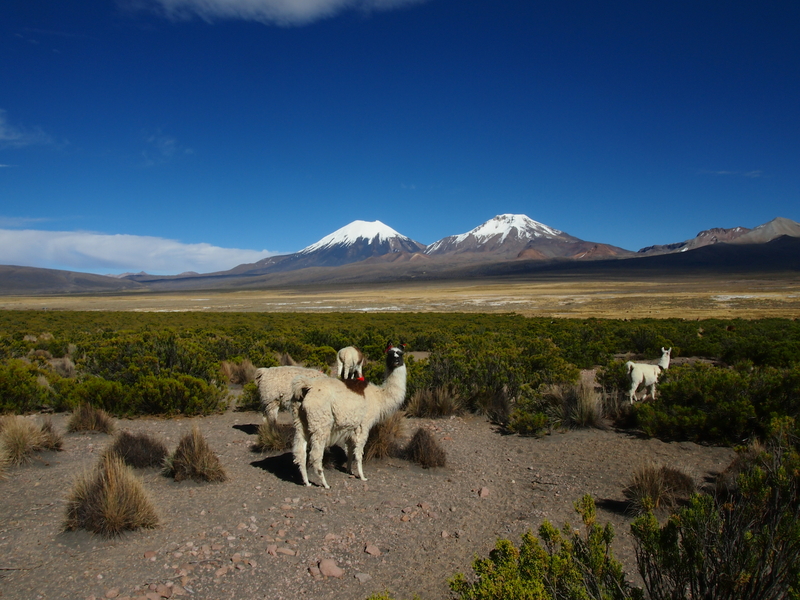 We then hiked into the almost as stunning Lauca national park in Chile, which deserves its own blog post!